Last night, the Football VN has just made the greatest mark in the football history when their team (U23) beat U23 Iraq in the match of quarter-finals to put their name into the semi-finals and continue miracle for their journey at U23 Asia Cup. 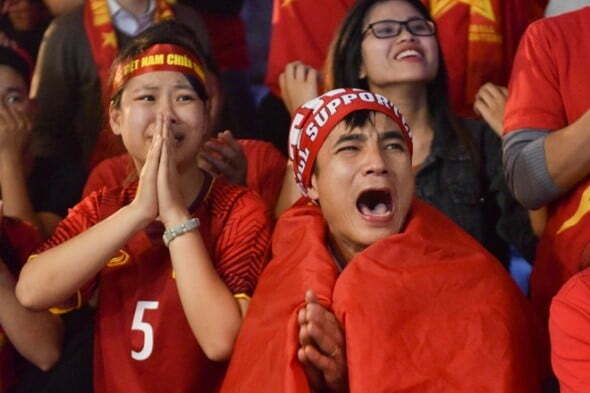 In a country where the football love is much more important and greater than all other society facets, we can understand how excited all VN people feel. They had a no-sleep night to breath, to live with and to be crazy with their win. At this moment, I suddenly find out some common points between football and testing – the two things sound like very different. But if we think out-of-the-box and look at them creatively, we can link them with some aspects. Mentality and Belief: In football, if you have to fight with a much stronger team and you believe that you cannot win them, surely you will not win. Likely, in software testing, if you are testing an application being built by excellent guys (guru) or by the famous company and you think that no way to have bugs exist in the application, then you will not able to catch anything even they obviously appear in front of your eyes. When delivering the testing workshop at some events, I have given a challenge to test the font size of Notepad to the attendees, almost they believed that the software was built by Microsoft, it should have been good. Even when some abnormalities revealed, they still tried to explain and proved the “nonsense” things become “sense”. Therefore, to be successful, in football, we first have to have a great belief of win and in software testing, we have to believe that we always find out bugs for any applications. Football game is an exploration: In the match last night, U23 VN knew nothing about their competitor, so they accessed the match by exploring their competitor’s weakness with various approaches. If you have watched the match, you would see sometimes the VN U23 organized and attacked from the left side, sometimes from the right side or attacked directly to the goal. They used both long & short passes to point out the most weakness from their competitor. This is the typical approaches used in almost football games. Even if your team know well about your competitor you also don’t know exactly what your competitor’ strategy in advance, and so you have to explore and adapt to the given context. Similarly, testing is exploring. You don’t know where the bugs exist. Only through exploring and evaluating the software you are able to catch them. Interestingly, how fast you recognize the problem to raise the bugs before they are caught by others or escaped to the production, it is important like how fast you know your competitor’s weakness based on your exploratory skills before your competitor finds out yours. U23 Iraq vs U23 VN – Traditional Testing vs Context-Driven Testing: In the match last night, U23 Iraq coach only applied rigidly an approach which is their strongest is to use long balls for their tall players to head for scores. Other the other side, U23 VN approached the match flexibly and adaptively, all their positions have frequently changed that depended on the context. The game reflected exactly the opposite of two approaches – Traditional Testing (script-based) and Context-Driven Testing (Scenario/Context-Based). And the win cannot be made by only one script. To Win, need to have a good external observation: In football, ability to read the game of the coach is the most important to make the win. In testing, you will do it better by pairing with your colleagues. When performing the testing alone, especially when you pay attention to some things, you can miss a lot of other things (called inattentional blindness). If you do pair exploratory testing, your colleague will help you point out the missing scenario or the things you have not seen. Whatever the next game result is, U23 VN will have to continue their journey forever. Likely the testing will not end. Let’s keep these moments and make ourselves to be joy & happy and to be sharp in both skills and mind. Congratulations to VN U23 Team!! !